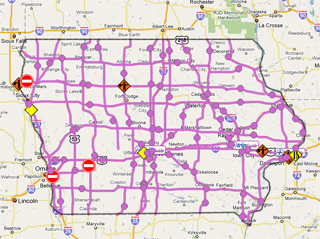 The DOT road conditions map showing purple or "difficult" travel on most roadways as of 11:30 today. Iowa Department of Transportation spokesperson Dena Gray-Fisher says they are asking people to stay off the roadways in many areas of the state. Gray-Fisher says no travel is advised in all of western Iowa, parts of central, parts of north central and the corridor of south central Iowa. There are many areas where the roadways are partially closed in western Iowa. Dozen of accidents have added to the problems. That includes an accident and cattle roundup on Interstate-29 in the southbound lanes from Sloan to Whiting in western Iowa. She says a semi jackknifed and ended up in the ditch and the cattle got loose and were running around on the interstate. Gray-Fisher says the cattle have been rounded up. Gray-Fisher says they will keep trying to fight the snow while they can and will make a decision later on how long to keep the plows out if the wind continues to be a problem. Gray-Fisher says the amount of daylight will probably determine how long they can keep working. Right now she says all the plows are out and working, but she says conditions to the north have worsened, as Minnesota has closed roads in four southwestern counties. That impacts people traveling north from Iowa, as it is illegal to travel in Minnesota on a closed roadway. For the latest road conditions, visit: www.511ia.org. The increasing winds are causing all sorts of decisions on how to handle the blowing snow. Dan Waid, the Hamilton County engineer, says he’s ordered all snowplows in the county to return to their garages due to white-out conditions. Waid says, “We brought the plows back in just because of the visibility, with the wind the way it is, they can’t see to safely perform the job out there.” We’re only a little over two weeks into winter, yet many communities are deep into their snow removal funds. Waid says Hamilton County has already spent about 40% of its winter budget. Pat Powers, KQWC, Webster City contributed to this story.